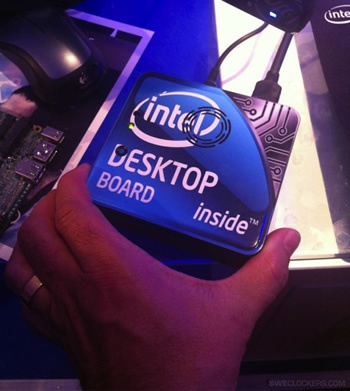 At Computex, Intel has revealed plans for a new small form factor PC which packs an Ivy Bridge Intel Core i3 into a 4x4 inch chassis. The chip maker has dubbed its new PC as the "NUC" or the Next Unit of Computing. According to the Tech Report, Intel expects to see these tiny PCs hit the market as early as Q3 of this year at a price of around $400. When the paperback book-sized computer debuts, it will pair those Core i3 processors with an adorably-sized motherboard based upon the company's aging but capable HM65 chipset. Users won't find USB 3.0, but they will see at least three USB ports. Also on the features list is dual HDMI, 4GB of RAM with two SO-DIMMs, a 40GB mSATA solid-state drive and at least one mini-PCIe slot. Oh, and there's the usual Wi-Fi and Bluetooth connectivity options we're used to finding on just about everything these days. If packing an i3 into a 4x4-inch PC doesn't tickle you in the right areas, Intel also plans to release i5 and i7 variants at a later date. Intel's latest generation of 22nm Ivy Bridge CPUs feature significantly less power draw and superior thermals to previous Core processors, a fact which will likely help the company stuff that kind of horse power into such a miniscule package. The NUC demonstration unit was equipped with a Core i5 showing a top speed of 2.7GHz. While rendering a 3D scene with Cinebench, the processor had maxed out at 79*C -- a very warm temperature but well within acceptable operational limits.